1-abc.net Hard Drive Washer - Your hard disk has never been cleaner before! Windows and nearly all other software that is installed on it produce temporary data. These disk space consuming files are used to remember personal data or user behaviour in the best case, but most of the time they only decrease the speed of your system the more is installed on it. Unfortunately there are not many programs that really take care about consequences of saving temporary files to different places, with different extensions or without always deleting when possible or necessary. 1-abc.net Hard Drive Washer does what all these programs forget. It searches for these unnecessary files and offers you to delete them. Besides conventional temporary files that normally are saved with a .tmp extension, there are more files that are not really required to keep your system running. Especially backup files that end on a .bak extension, .log files or files that were renamed to .old for security reasons months ago can be found and deleted easily with this program. 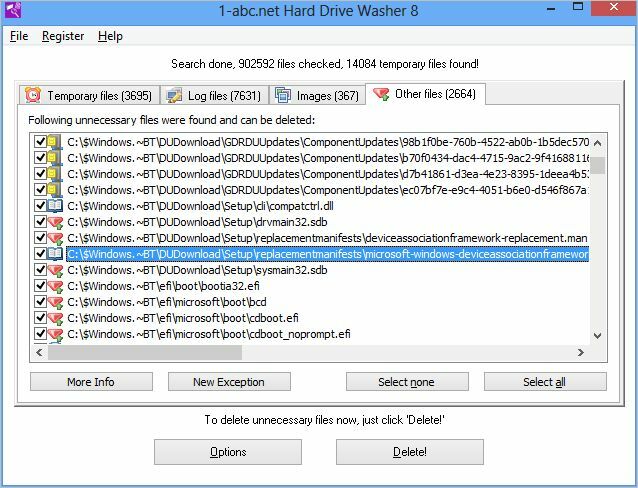 Additionally, 1-abc.net Hard Drive Washer can delete the whole content of temporary folders and allows the user to configure what files should be looked for. Of course it is also possible to edit the exceptions list for files that should not be deleted under any circumstances because not all software developers take care about what temporary files are normally meant for. Other nice features are the scheduling function (clean your hard disk each ... days) and the possibility to scan each drive including hard drives, floppy disks, camera cards and USB-sticks for unnecessary files. To keep it absolutely secure, all unnecessary data can be deleted to the Recycle Bin to enable undoing these changes.